It seems like everyone and their mom’s brother’s aunt’s girlfriend’s dog twice removed has the standard gold and wood grain Target bar cart. It now comes in a variety of styles and colors, all much more attractive than the one that I have. I purchased mine four years ago when Brian and I lived in a 600-square foot apartment and couldn’t afford to even drink alcohol. (Not a wise investment on my part.) But dangit, I wanted to be hip and stylish and bar carts were (and still are) all the rage! Over the years I’ve had a love/hate relationship with said bar cart. Let’s call him Harrelson… cause Woody feels inappropriate. Get it? Woody Harrelson! (He’s fantastic in Friends with Benefits by the way. Highly recommended movie.) But back to the point, Harrelson was much like an 18-year-old straight out of college. He didn’t know what he wanted to be. Sometimes he was a plant cart. Sometimes he was a bar cart. Sometimes he was just plain empty and ready to be listed on Craigslist. However, something in my gut just wouldn’t let me sell him. And thank goodness! Flash forward to present day when Jessica Brigham inspired me to start collecting thrifted decanters. Those babies needed a home and Harrelson was the perfect man.. er, I mean bar cart for the job! And that’s it! 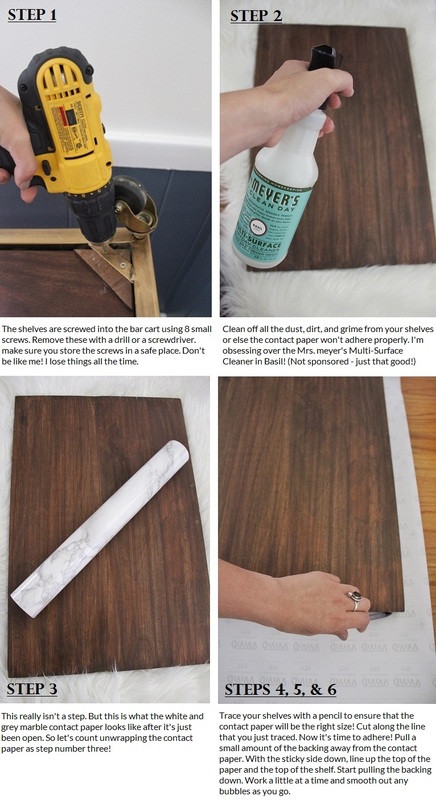 An under twenty minute DIY project that I KNOW you can do without batting an eyelash. Now add some fun decorations, load on the booze, call up your friends, and have yourselves a Saturday night in! I promise that your Harrelson (or whatever you decide to name him) will be the talk of the party. Just make sure my invite doesn’t get lost in the mail! Is white marble not your thing? Well you’re in luck because I’ve sourced five other affordable contact paper patterns from Amazon for your bar cart! Totally agree Autumn!! It’s a brand new bar cart now and I love it so much more. I know several people who found theirs at the thrift store.. so keep your eyes peeled! Awesome DIY. Also love how you’ve styled the bar cart. Those alcohol label tags are everything!!! Perfect for collected decanters! Totally agree – they add just the right touch of masculine to the feminine bar cart!! Love your bar cart – it’s so chic! The decanters really seal the deal. I keep buying them too…they’re so pretty, how can you not? This is a great use for them! Right Jill?! They’re just so sparkly and pretty and come in so many shapes and sizes! They’re my new obsession! Yes! I’m sure there’s a thrifted one out there just waiting for you Addy! Love your spare bedroom. Awesome blog. YOU GO GIRL!